The 11 megawatt PS10 solar power tower produces electricity from the sun using 624 large movable mirrors called heliostats. 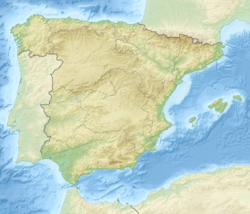 The PS10 Solar Power Plant (Spanish: Planta Solar 10) is a solar power plant in Sanlucar la Mayor, Spain. The plant is made up of a tower in the center of a large field covered in many mirrors. Each of the 624 moveable mirrors has an area of 120 m2 (1290 ft2). The mirrors reflect the light from the Sun to the top of the tower. The heat warms water within pipes in the central tower turning it into steam. The steam drives turbines which, at peak, put out 11 MW of electricity. The planet is really good for providing electricity during the hottest parts of the day when air conditioning demand is the highest. 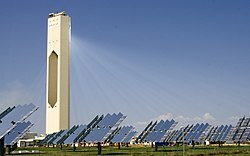 ↑ "Inaugurada en Sanlúcar una planta solar que producirá energía para abastecer a toda Sevilla". ElPaís.es. 2007-03-31. This page was last changed on 13 August 2018, at 15:17.